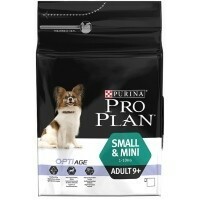 Purina Pro Plan OptiAge Small & Mini 9+ Adult Dog Food has been specially formulated for small and mini breed dogs that are 9 and over. The food meets the demands of senior dogs nutrition and contains a blend of nutrients proven to enhance brain function, increase activity levels, promote liveliness and interest in play for ageing dogs. Pro Plan OptiAge also helps to promote good dental hygiene and healthy joints.